I'm sorta with you on this, I liked it more than you did, but I didn't think it was anywhere near the great movie the general consensus seemed to think it was. I wonder if people (critics) took it to be some sort of profound anti-business statement, which I think plays well with critics. "Funny? Not really, just kind of amusing in that oh-that's-how-it-is-in-my-life-how-perceptive-of-them kind of way." Everything in the movie is like that. I didn't hate it or anything, but I'm just shocked that it has gotten the reviews it has. This doesn't even have the excuse that SLUMDOG or CRASH had as being emotionally manipulative "message" movies -- it's a frickin' indie comedy. 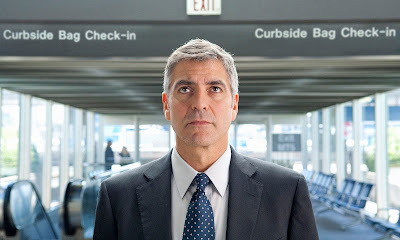 Oh, and I must have a man crush on Clooney, because I always seem to like him when everyone else doesn't. Go figure. And yet it is, because you've written about your response to the movie as honestly as possible, which is something that all critics should attempt to do. Nice job. And not just because I agree with you on many points (particularly that too much has been made of the movie's relevancy, if you will, in relation to the current unemployment crisis). Overall I clearly enjoyed it more than you -- I must have a man crush on Clooney, too -- but I certainly don't think it's an especially deep film. Review or not, I quite enjoyed reading this. Pre-hype usually poisons a film for me, but I usually find that direct contact can cleanse, if possible. There are a number of films I disliked because the hype was so intense, smarmy, and smug, but ended up enjoying when I finally saw them. Usually, however, I don't "love" them (one exception, though obviously not a "film", is Sopranos. At first glance, the Clooney film strikes me as a bunch of Hollywood know-it-alls wanting to have their cake and eat it too. Let's reference the sagging economy, but do so glamorously and from the perspective of the hotshot success rather than the poor dopes being laid off. If there's anything worse than Hollywood being out of touch it's Hollywood trying to be in touch and failing miserably, adding insult to injury in the process. But maybe I'll change my mind on direct experience and my prejudices will be shown up as just that. Most likely, I'll find it amusing and lightly entertaining, if still somewhat smug, and certainly overrated. We shall see...though probably not until it comes out on DVD. At any rate, it's interesting you want to move in the direction of reviewing only what interests you. I'm sort of leaning the other way - flirting with the idea of reviewing new releases with some regularity. I'm getting a little tired of being so out-of-touch with contemporary cinema. I've seen a lot of great classics over the past few years, but as a film-writer and aspiring filmmaker I feel I have some lingering obligation to keep an eye on what's actually going on in the film world at the moment. In the past year, for economic as well as other reasons, I barely went to theaters at all. Of the big releases, I think I saw only (500) Days of Summer (in order to review it for my newfound Examiner post) and Antichrist. Overall, I certainly saw less than ten 2009 new releases in theaters. Which is fine but I'm not sure I want the trend to continue (of course, it started for a reason, probably around 2003 - the reason being that virtually every time I went to a movie in theaters I was disappointed and frustrated). I'm not sure I'd say I didn't enjoy it. It just didn't register at the level that so many critics were praising it. You know, it's just unimpressive. Like Troy says above, "I didn't hate it or anything, but I'm just shocked that it has gotten the reviews it has. This doesn't even have the excuse that SLUMDOG or CRASH had as being emotionally manipulative "message" movies -- it's a frickin' indie comedy." "...it's interesting you want to move in the direction of reviewing only what interests you. I'm sort of leaning the other way - flirting with the idea of reviewing new releases with some regularity. I'm getting a little tired of being so out-of-touch with contemporary cinema." I'm not going to shut the door on contemporary films. I still plan on seeing all of them. HOWEVER, I'm only going to write about them when I'm moved to. And this applies to both good and bad. Last night, I saw CRAZY HEART and I've really got a hankering to write about that little gem. What I meant, is I'm not going to prioritize contemporary films over classics I want to get to, not when I've put off continuing my Pasolini Retrospective; examining post-neorealist Italian cinema; and so many intriguing films I have sitting on my DVR like THE ASPHALT JUNGLE, BEAT THE DEVIL, THE CAINE MUTINY, D.O.A., THE DUCHESS OF LANGEAIS, LES ENFANTS DU PARADIS, A FACE IN THE CROWD, HUSBANDS, IMITATION OF LIFE, IN A LONELY PLACE, JULES ET JIM, LADRI DI BICICLETTE, THE LAST DETAIL, MAGNIFICENT OBSESSION, PARTY GIRL, PERFORMANCE, PERSONA, and THREE DAYS OF THE CONDOR (consider this a preview, and a contract to keep me honest).